Many logisticians are keen to understand the basics behind effective distribution centre design. This is a complex area as there are scores of variables that have to be considered. So to help you along, without getting into tedious details, here are some proven rules of thumb that you can apply if you are designing a new warehouse or making changes to an existing facility. 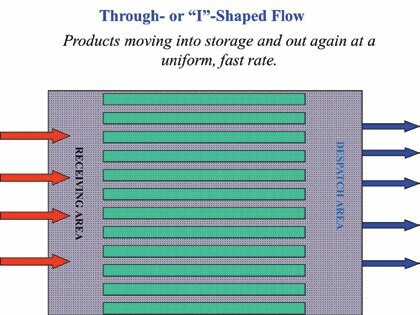 Warehouses that receive at one end and dispatch from the opposite end are flow-through or ‘I’ shaped layouts. These are commonly used for high-volume operations, or where complete separation of receiving and dispatch operations is required. While I designs are widely used, these designs required greater hardstand areas than the alternative ‘L’ or ‘U’ shape designs. 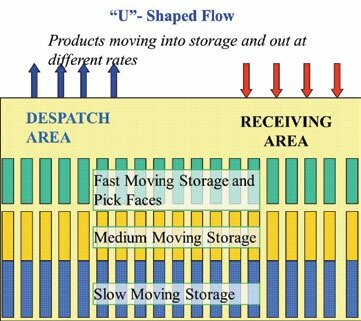 Receiving and dispatch operations that are adjacent, on the same side of a warehouse are known as ‘U’ shape designs. The majority of distribution centres are designed as U-shaped. This is because they offer the best ratio of building-to-land use and minimise the amount of hardstand required for receiving and dispatch vehicle movements. ‘L’ shaped designed warehouses typically receive on one side and dispatch on an adjacent side at 90 degrees from the receiving side. 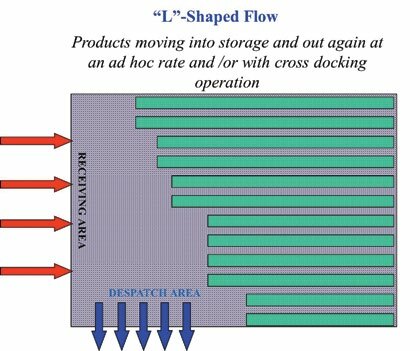 Many cross-docking operations employ an L-shaped design, along with organisations that receive goods in large trailers but dispatch in smaller vehicles. In some cases, modern distributions may include two or three of I, U and L designs. Particularly where a number of methods to market are required, e.g. direct to store deliveries, business to distributor, business to consumer, and business to route. They may also be used where facilities need multiple chambers to store temperature sensitive or dangerous goods. In all cases the key design drivers are spatial planning, vehicle types accessing the site, flow, and volume. For conventional warehouses the most efficient method of operation occurs when racking runs in the same direction as incoming materials. This allows forklift operators free access from receiving and to dispatch docks. Placing the racking at 90 degrees to incoming materials is not recommend as funnelling and bottlenecks can occur, as forklifts are forced to use central aisles to put-away and retrieve stock. What level of mechanisation should be applied? Number of stock keeping units (SKU) or products handled. Volume of picks per day, week or month. You may ask why picking is a point of focus. This is because order picking can absorb up to 80% of resources within distribution centres, so every effort to reduce time and resources to fulfil orders will mean savings to your business. 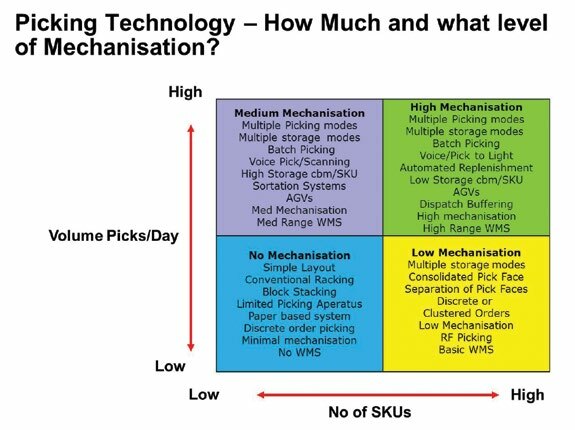 Conceptually, the matrix shows how SKU and picking volume form the basis for justifying mechanisation. Providing the right docks and loading bays in a distribution centre should be straightforward, but sadly it’s not, as many warehouse operators can testify. Consider the variety of vehicles that may visit your warehouse, and the numbers of each. E.g. pantechnicons, rigid vehicles, temperature controlled end-loading trailers and B-Doubles, ground delivery side- or end-loaded vehicles, utilities, side-loaded trailers and B-Doubles and rigids, courier vans, motor bikes and push bikes. Ignoring or overlooking any one or more of these groups, can cause deficiency in dock, loading bay and hard stand design. As a general rule, if a dock or loading bay is 75% utilised, you should provide an additional one. How tall should my building be? Over the decades building roofs have progressively been getting higher. In Australia’s manufacturing past, pre- and post-WWII industrial facilities were 5.5 to 6m high. Many were of saw tooth design with lots of columns throughout. Fortunately, these have largely been demolished and replaced with portal frame buildings as high as 11 or 12m at the springing line. The portal frames allow much longer spans across the warehouse and minimise internal rows of column to only one or two. This provides designers with freedom to install many varieties of equipment to a height of 10m to 11m. However, where high-bay warehouses (for automatic retrieval systems) are considered, there are limited developers willing to take them on. This is because history reveals that it’s hard to lease specialised high buildings after the first user has exited, compared to lower height facilities. This trend is changing though, due to increased urbanisation, so more high-bay warehouses are tipped to be constructed in coming years. 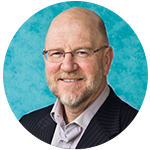 (See my previous article ‘Spotlight on ASRS’, MHD July/August 2017 – available at http://bit.ly/2ytso4y). What are the rules of thumb for planning and design? Never design your building to be circular, triangular, or square! Avoid trapezoids and parallelograms if you can. Why? Despite whatever architectural licence is used to make warehouses look great, the best shape is the humble rectangle. Over the years, I’ve found it to be the most efficient shape for distribution centre design. Ideally at a ratio of length = 1.7 x width. Rules differ across states and councils on the allowable building size as a proportion of land size. In many instances, 50% of the land space can be planned for buildings. An additional consideration is the recent spatial rules applied by some councils to alleviate floods and to promote greater green space. In effect, they dictate a greater percentage of permeable land, which may in turn restrict the amount of non-porous hardstand that can be laid. Many completed warehouses can suffer from ab over-concentration of materials handling and storage equipment. This can have a drastic impact on the operation of the facility. As a guide, for most warehouses, from 20 to 25% of the available warehouse floor space should be allocated to receiving and dispatching operations. The balance of 75% is usable for storage equipment and picking systems. For semi-trailers’ movement, in and out of facility and reversing into docks, allow 37 to 40m. For B-Doubles, allow 50 to 55m. However, where B-Doubles drive through and do not reverse in, 37 to 40m is sufficient. It’s best, in Australia, for vehicles to flow in a clockwise direction, to allow for driver side reversing. While this is not always achievable, it’s preferable over anticlockwise operation, as driver visibility is better. Allow for 1.2 sqm per pallet for conventional selective racking systems. Push up to 1.4 for narrow aisle or double deep systems. More pallets or more forklift room to manoeuvre? What is best? More pallet racking with narrower aisles, or less pallet racking and wider aisles for fork lifts to menoeuvre in? In my view the priority should always be ‘operation’ over ‘capacity’. The building will be set up once, but operations will continue year after year, so wise planners give manoeuvrability the priority. Hopefully the rules of thumb will help you be effective in your design quest, but please remember that there are many other aspects that are relevant. Perhaps you have learned from your own experience and have a few tips of your own. Drop me a line if you do, as I am always interested in hearing what others have faced during the design process. I would add to the principles outlined above in the design of a distribution center, the importance of defining a warehouse storage plan (defining zones and location, storage equipment and handling technologies focus on movement continuity (minimize number of material touches) and movement scale economies (handle or move the largest quantities possible). For any practitioner, your very good and practical information can be successfully used in the efficient organization of a distribution center.